Everyone has that handful of restaurants that you just crave their food; and Casablanca is one of those restaurants to me. 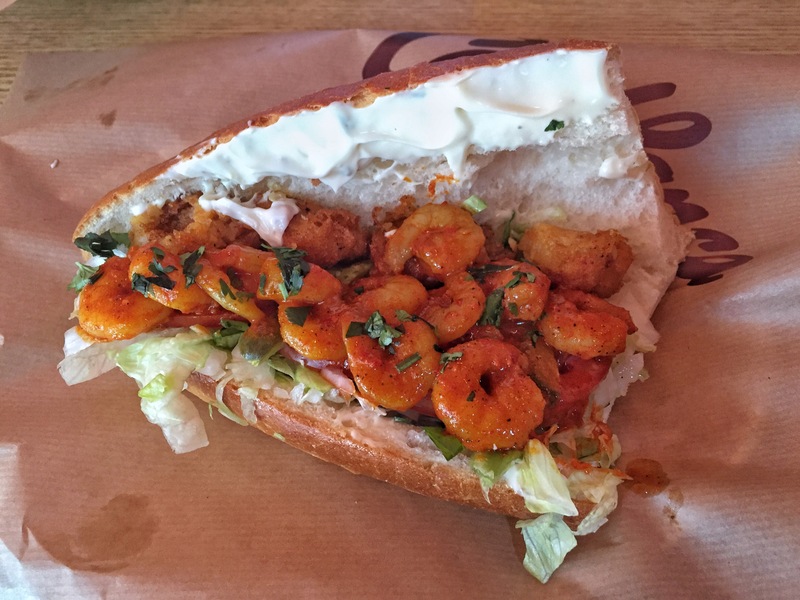 Usually once a week, I will tell Scott that I NEED a Shrimp Sandwich; this request is usually met with some eye rolling (not because he doesn’t enjoy their food, but because Scott doesn’t understand my food cravings! ), but hey “happy wife, happy life” right? So where is Casablanca located? It is in Haeboncheon (HBC). Go about 0.1 mile from the entrance of HBC and you will see it on the left, after Bonny’s pizza. The menu is simple, but delicious. For those of you who don’t know what a Shakshuka is, it has a tomato sauce base (not like spaghetti, more spices are involved) and mixed in is the meat or veggie of your choice, topped with an egg. All of this is served on a piping hot plate (called a tajine) and brought to your table with some bread mmmmmmm. 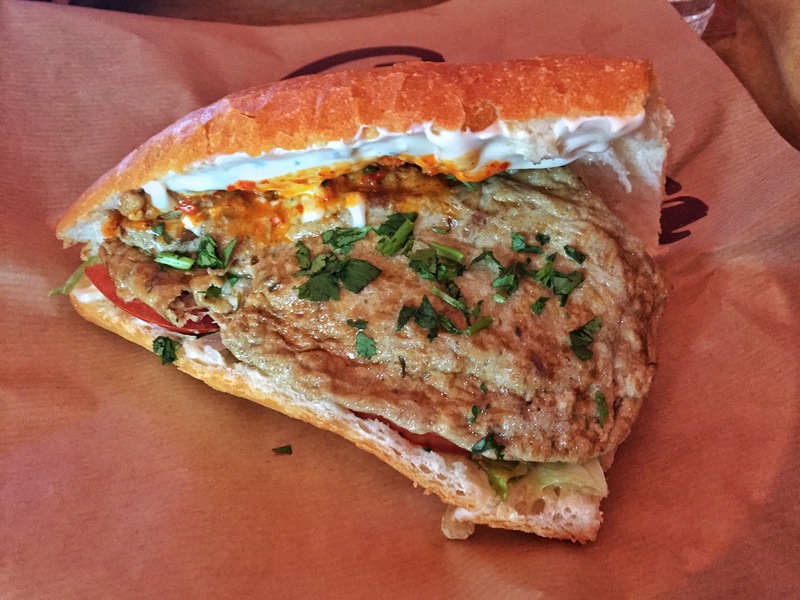 Even though the shakshukas are fun and tasty, don’t discount the sandwiches, as they are so good. First of all, the sandwich is served on this really crusty baguette bread, it gives that perfect crunch on the outside, with a soft fluffy interior. Then they add in a white spread (not sure if it’s sour cream or yogurt) which is a little tangy, there are also some potato balls (which are perfectly fried and nice and creamy inside), and then there is a mix of lettuce, tomato, onion, and cilantro. The flavor profile of the sandwich, really hits the mark for me. After my gushing about the sandwiches, you can guess that my favorite thing at the restaurant might be a sandwich, so the question now is which one? Well I can’t pick just one, so my two favorite are the Spiced Shrimp Sandwich and the Berber Omelette Sandwich. The Shrimp Sandwich I think is pretty self explanatory, but keep in mind that it does have a hint of spiciness to it, but that’s one of the reasons I love it. You may be confused why an omelette on a sandwich would be one of my favorites, and I will just say, order it and try it, I am pretty sure you will love it. The omelette is super moist and flavorful, and when combined with the rest of the sandwich, a medley in your mouth for sure. Sometimes we order a shakshuka as well, but not everytime; I just don’t have enough room in my tummy… Here is a video showing what the the shakshua look like, and like I said, they come out piping hot! So good! 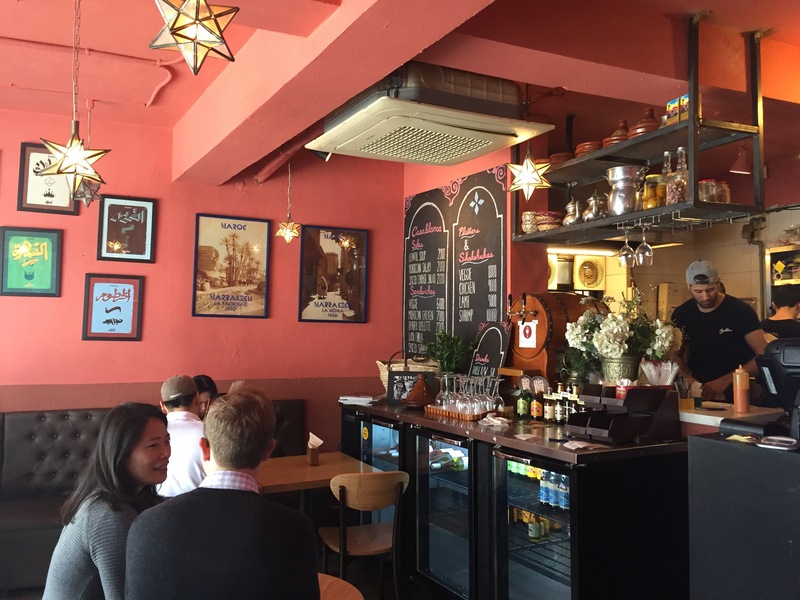 Recently, the owners of Casablanca have opened a new restaurant; Morococo Cafe. 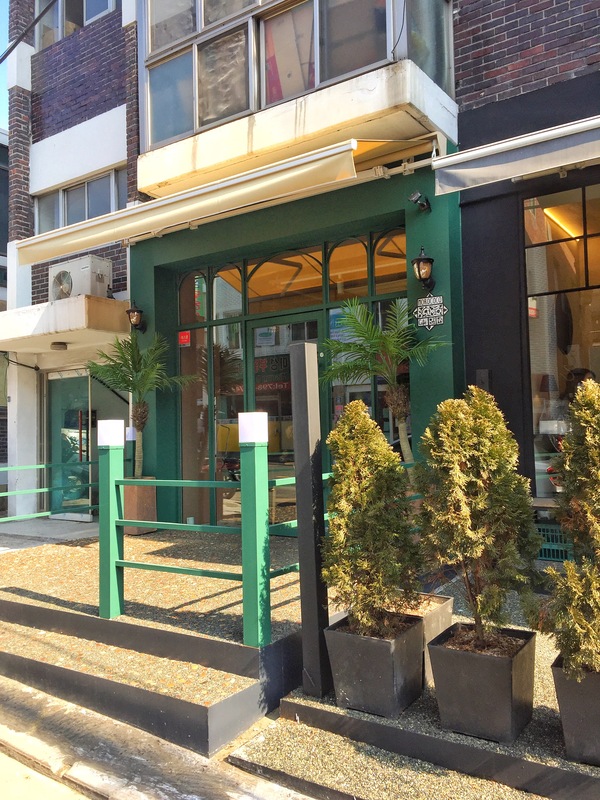 This new restaurant is located right across the street from Casablanca. 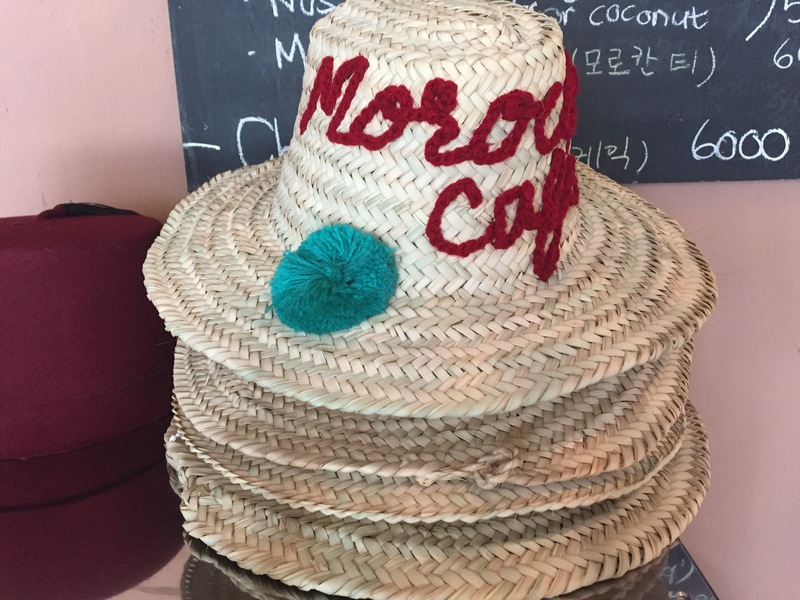 Morococo Cafe is almost like a smaller carbon copy of Casablanca in appearance. Hours of Operation: 5:00 PM – 10:00 PM (Closed Monday) Sometimes they are open earlier than that, but if you want the full menu, play it safe and show up during official business hours! This is their current menu. Since we were there for lunch, and they hadn’t quite finished their food prep (they are really only open at dinnertime), we weren’t able to order from the full menu. However we did get the Chermoula Carrot Salad, Preserved Lemon Chicken with green olives, bread, and a Nas Nas Cafe. 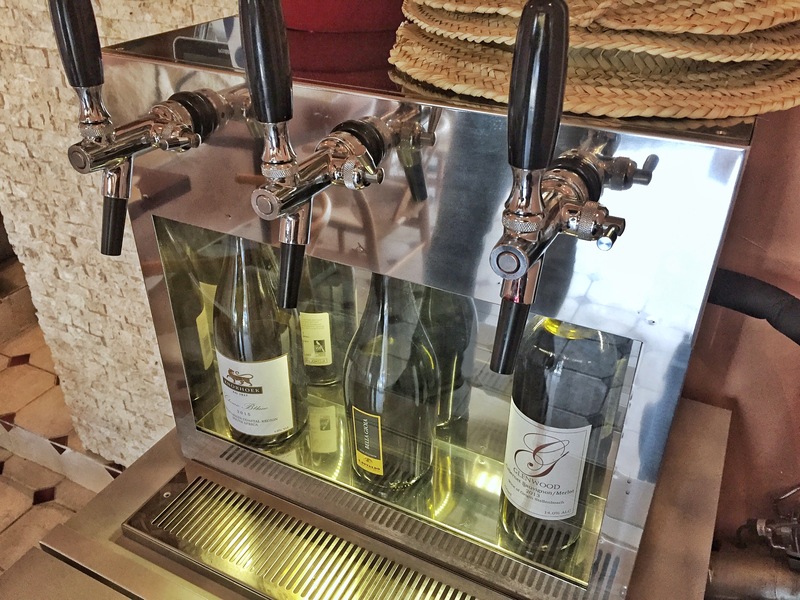 If you want some wine with your meal, Morocco Cafe even has a little wine dispenser machine, how cute. I wasn’t sure how good a carrot salad could be, but apparently I have a thing or two to learn. The carrots are nice and soft and have been cooked in some blend of spices, along with these yummy carrots are some almonds, and some AMAZING caramelized dates that are coated in sesame seeds. I was reluctant to share the dates with Scott, but he coaxed me out of one of them. The salad was really a nice start to the meal, but I wonder if next time I could get a side dish of dates only…hm…. Next up was the chicken, super tender and juicy and a hint of lemon flavor. I was worried it would be overly sour, but it wasn’t at all, nice mild flavors. We used our bread to sop up all of the yummy sauce. Overall a really delicious meal. 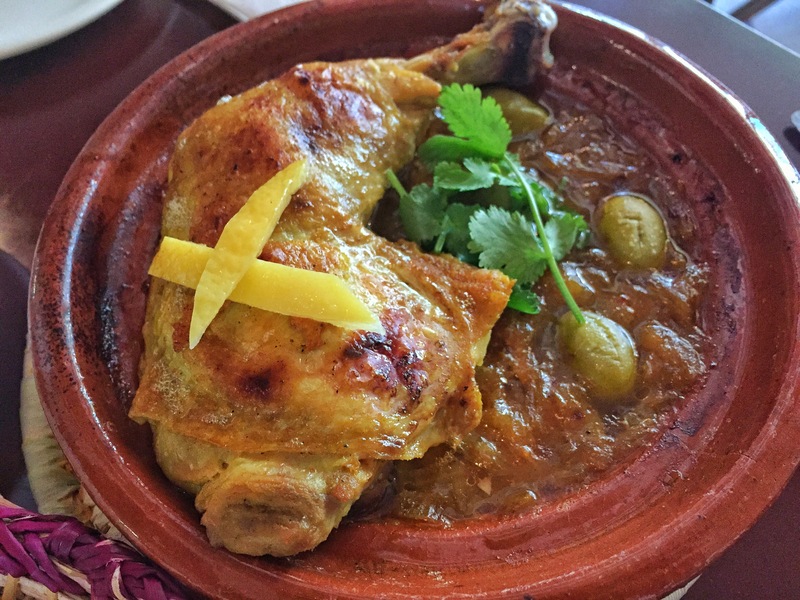 Morocco Cafe won’t replace my love for Casablanca, but it’s a nice addition to the dishes that they serve. 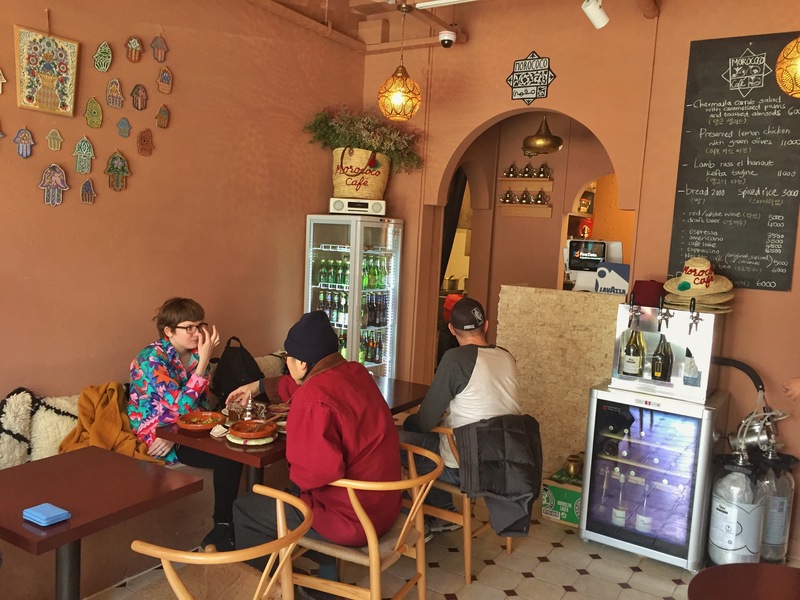 I will definitely be back to try the Lamb Tagine. 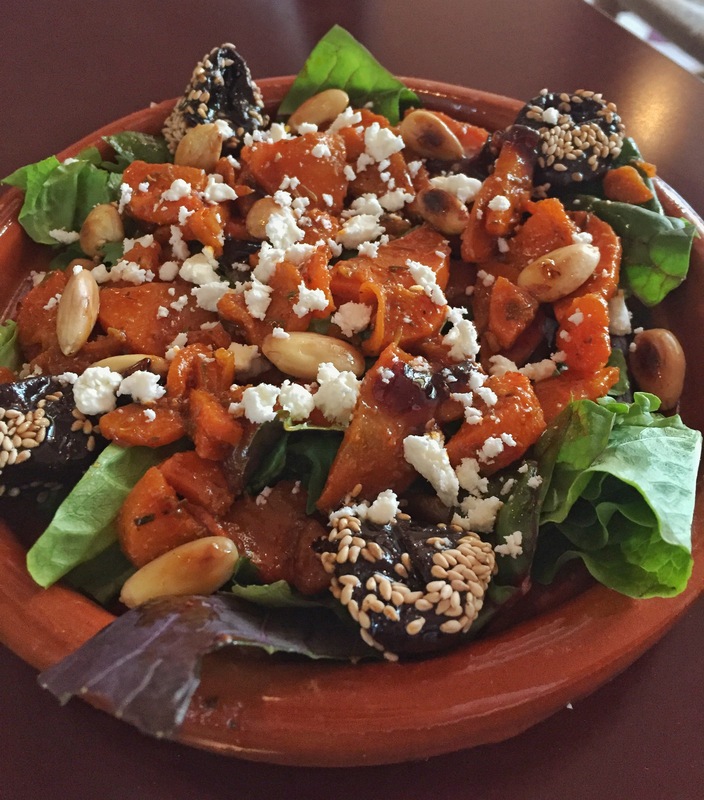 Try one or both, but definitely stop by for some delicious Moroccan food!